Chateau / Country House1883 sq. ft.
Cosy oak half timbered house, approx. 175sq.m living space, 1500sq.m natural grounds, small pond. A 'beach' with a roofed wicker beach chair can be used as sand box. There is a forest behind the house, no immediate neighbours and a large wooden terrace. The whole house has either wood flooring or tiles and is thus very suitable for people suffering from allergies. Perfect for large families, several couples or groups. There is a projector and a flipchart. The ample living area with open kitchen and fireplace, washing machine and tumble drier are found on the ground floor. Double room with (separable) double bed & twin bed, bathroom with shower & tub. Double room with (separable) double bed & shower room. Bedroom with 2 single beds and shower room. Bedroom for 3 with three twin beds & bathroom with tub. - Two sleeper couches (for two each). - Separate holiday apartment (two rooms), large French bed, kitchen, shower room, which can be rented as well if needed. Conferences and groups: The house is equipped for small conventions and groups (up to 15 people). It is a self-catering house, but catering can be arranged. Equipped with a projector, telephone, fax, Wi-Fi and printer. The tranquillity and closeness to nature increases your focus on content. Each bedroom has a private bathroom. There is a guest cloakroom downstairs. Modern, very personal touch. No old fashioned 70s/retro aesthetics. Ein sehr schönes Haus in guter Lage. 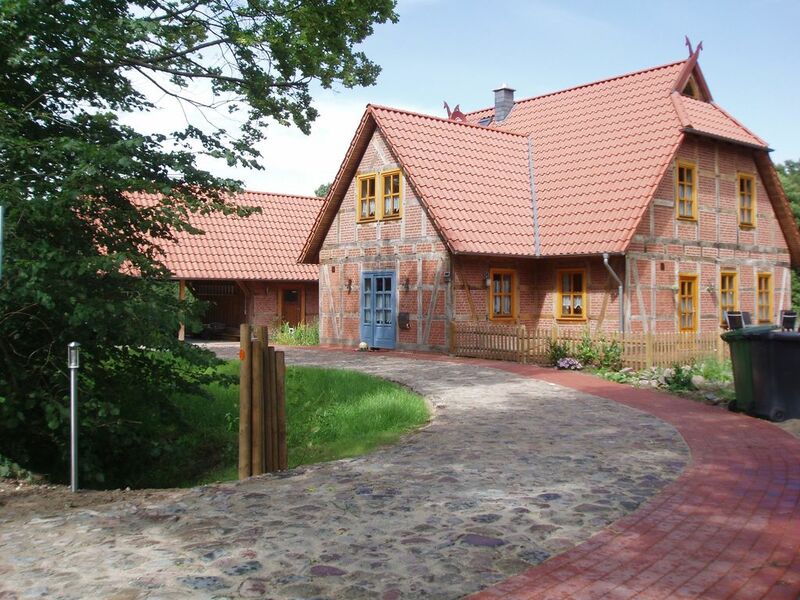 About 10 km away from Walsrode (and all its shopping facilities), the motorway and the train station you can find the wonderfully tranquil and traditional village of Stellichte, nestled into large and well-kept forests with lots of deer, inviting you for walks and hikes. Stellichte is one of the seven villages that Hermann Löns justifiably called Heideperlen (pearls of the heath). The idyllic village is dominated by its knight manor (water castle), renaissance chapel and half-timbered houses, interspersed by ancient oaks and the river Lehrde with its upper and lower water mill. The atmosphere is calm, inviting you to relax and let go of the stress of the city and everyday life. The village has a baker who still makes everything himself. Definitely recommendable is the excellent Butterkuchen (butter cake). There is a small shop for everyday groceries. Directly behind the house begins the large forest, perfect for relaxation. Golf: Two beautiful golf courses in the immediate vicinity: Fallingbostel - Tietlingen, 7 km away and Soltau, 25 km away (especially beautiful). Ski: There is an indoor-skiing facility called Snow-Dome in Bispingen, approx. 25km away. You can rent equipment there.